Previous experiments have shown that a decoction of Bauhinia forficata leaves reduces the changes in carbohydrate and protein metabolism that occur in rats with streptozotocin-induced diabetes. In the present investigation, the serum activities of enzymes known to be reliable toxicity markers were monitored in normal and streptozotocin-diabetic rats to discover whether the use of B. forficata decoction has toxic effects on liver, muscle or pancreas tissue or on renal microcirculation. 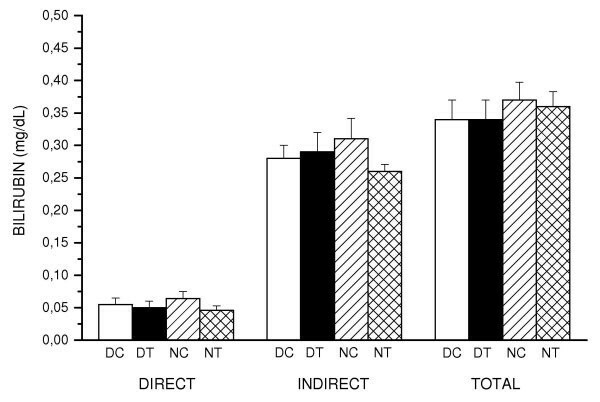 An experimental group of normal and streptozotocin-diabetic rats received an aqueous decoction of fresh B. forficata leaves (150 g/L) by mouth for 33 days while a control group of normal and diabetic rats received water for the same length of time. The serum activity of the toxicity markers lactate dehydrogenase, creatine kinase, amylase, angiotensin-converting enzyme and bilirubin were assayed before receiving B. forficata decoction and on day 19 and 33 of treatment. The toxicity markers in normal and diabetic rats were not altered by the diabetes itself nor by treatment with decoction. 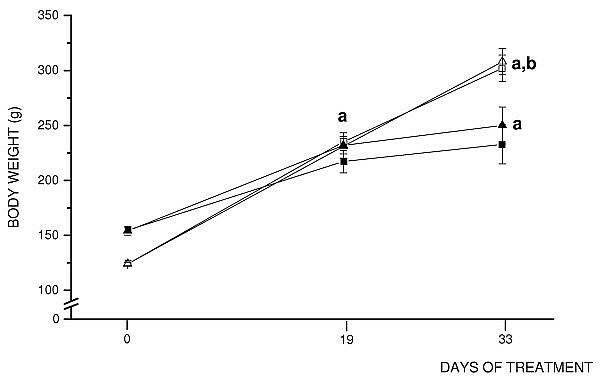 Whether or not they received B. forficata decoction the normal rats showed a significant increase in serum amylase activity during the experimental period while there was a tendency for the diabetic rats, both treated and untreated with decoction, to have lower serum amylase activities than the normal rats. Administration of an aqueous decoction of B. forficata is a potential treatment for diabetes and does not produce toxic effects measurable with the enzyme markers used in our study. The tree Bauhinia forficata is a member of the Brazil-wood family (Caesalpiniaceae)  commonly known in Brazil as "Pata de Vaca" or "Unha de Vaca" (cow's hoof) and the USA as the "Brazilian orchid-tree". Phytochemical research has revealed that this plant contains alkaloids, tannins, mucilage, essential oil, cyanogenetic heteroglycosides, anthocyanins, saponins, catechols and fixed volatile acids [2, 3]. In Brazil, B. forficata is one of the most frequently used anti-diabetic herbal remedies and we have shown  that administration of an aqueous decoction of fresh B. forficata leaves to streptozotocin-diabetic rats for a month lowered the levels of serum and urinary glucose and urinary urea in comparison to diabetic rats which had not received decoction. Plants can, however, have toxic side-effects [5, 6] and because nothing has been published on the toxicity of B. forficata we tested orally administered B. forficata decoction for its effects on the toxicity markers amylase (pancreas toxicity), creatine kinase (muscle toxicity), lactate dehydrogenase (muscle and liver toxicity), bilirubin (liver and biliary toxicity) and angiotensin-converting enzyme (renal microcirculation and kidney toxicity). Material from a B. forficata tree in the Medicinal Plants Garden of the School of Pharmacy, Araraquara, São Paulo State, Brazil was identified, authenticated and deposited in the Herbarium of the Department of Industrial Pharmacy, Federal University of Santa Maria, Rio Grande do Sul, Brazil, as accession no. 119, by Dr. Gilberto Dolejal Zanetti. Leaves were collected from this tree between April and May and a decoction prepared by the method normally used in the Araraquara region, i.e. boiling 150 g of fresh leaves in a litre of water for 5 minutes, allowing the decoction to stand for 30 minutes and filtering it through a paper filter, the final yield of filtrate being 87% v/v. The decoction was prepared every 2 or 3 days and kept in brown-glass bottles at 4°C. All rats were fed a normal laboratory chow diet containing (wt/wt) 16% protein, 66% carbohydrate and 8% fat and were housed under a 12:12 h light and dark cycle at 22–25°C. The experimental protocols and the treatment and care of the rats followed the rules of the Brazilian ethics committees . A group of 50 male Wistar rats were allowed to adapt to metabolic cages for 2 days and then deprived of food for 14–16 h and weighed [mean body weight (bw) = 129.5 ± 1.2 g] and anaesthetised with ethyl ether. Thirty of the rats were randomly selected and diabetes induced in them by injecting a solution of streptozotocin (50 mg/kg bw dissolved in 0.01 M citrate buffer, pH 4.5) into the jugular vein of each rat, the remaining 20 rats being injected with 0.9 % saline by the same route, these being denominated 'normal rats'. All rats were then returned to their metabolic cages where they had free access to food and water. 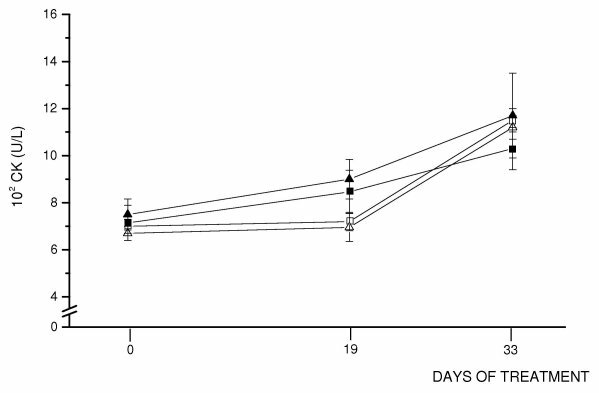 Four days after streptozotocin injection the 30 diabetic rats were assessed for body weight, food and liquid intake, urinary glucose and urea, and (using tail-tip blood) plasma glucose and serum bilirubin and amylase, creatine kinase, lactate dehydrogenase and angiotensin-converting enzyme activities. Ten pairs of rats with diabetes of a similar degree of severity were selected from the 30 diabetic rats by matching their body weight, plasma glucose level and urinary glucose and urea excretion as closely as possible. One diabetic rat from each pair was randomly assigned to the diabetic-treated (DT) group (n = 10) and received B. forficata decoction freely in place of drinking-water while the other diabetic rat was assigned to the diabetic-control (DC) group (n = 10) and had free access to drinking-water. The remaining 10 diabetic rats could not be closely matched and were not used. The 20 normal rats were assessed for body weight and serum amylase, creatine kinase, lactate dehydrogenase and angiotensin-converting enzyme activities. Ten of the 20 normal rats were randomly assigned to the normal-treated (NT) group (n = 10) and received B. forficata decoction freely in place of drinking-water while the other 10 received drinking-water and constituted the normal-control (NC) group (n = 10). All four groups received water for the first six days after streptozotocin injection, after which the water in the metabolic cages of the diabetic-treated and normal-treated groups was replaced by decoction while the rats in the diabetic-control and normal-control groups continued to have access to plain water. Twenty-five days after injection with streptozotocin or saline and 19 days after being given access to decoction the rats were weighed and their serum enzyme activities measured. Thirty-nine days after injection with streptozotocin or saline and 33 days after being given access to decoction the total volume of decoction or water consumed was calculated for each rat and the rats weighed and then sacrificed at between 8:00–9:30 am by decapitation and samples of the free-running blood collected and the serum enzyme activities and bilirubin determined. Two hours before sacrifice, blood samples were collected from the tail of each rat and used to determine serum creatine kinase activity. Blood samples for plasma glucose determination were collected in Eppendorf tubes containing liquaemin sodium which were cooled in ice for 30 minutes and then centrifuged at 1000 × g for 10 minutes and the serum separated. Blood samples for serum enzyme assay were collected in gel separator tubes (Becton-Dickinson) and the serum separated by centrifuging at 1000 × g for 10 minutes. Serum angiotensin-converting enzyme activity and urinary glucose and urea were measured up to 30 days after collection of the samples, which were stored at -20°C until assayed. Lactate dehydrogenase activity was measured within 4 days of collection using serum stored at 25°C and creatine kinase activities within 7 days from serum stored at -20°C. Plasma glucose, serum bilirubin and amylase were measured immediately after blood collection. All analyses were made on the same day in groups of 10 samples. Urinary glucose was measured by the o-toluidine method of Duboswski  and urea by the urease method [9, 10]. Plasma glucose was determined in a Bayer Technicon RA-XT autoanalyser. Colorimetric methods were used to measure lactate dehydrogenase  and amylase activity  and the total serum bilirubin concentration was measured using an unconjugated indirect assay  and a glucuronic acid conjugated direct assay . Creatine kinase  and angiotensin-converting enzyme  activities were measured by kinetic spectrophotometric methods. All assays were performed using an Hitachi U 1100 spectrophotometer. Reagents were purchased from Merck or Sigma and were of at least analytical grade and the sample storage times and temperatures rigorously controlled to minimise deterioration. Means and standard errors were calculated from the data and analysed using two-way analysis of variance (ANOVA), the Newman-Keuls test being used for subsequent multiple comparisons between groups for identical periods and over time within groups. The unpaired Student's t-test was used to analyse the bilirubin data. The significance level was p < 0.05. Four days after injection with streptozotocin and 2 days before administration of decoction (time zero), the diabetic-treated and diabetic-control groups showed practically the same pattern of physiological and metabolic alterations (Table 1) and there was also no difference between any of the four groups, either at time zero (Figure 1) or throughout the 33 days of the experiment, in lactate dehydrogenase activity. Physiological and metabolic variables for streptozotocin-diabetic rats. DC = diabetic-control; DT = diabetic-treated; Δw = weight-change relative to the weight on the day on which the streptozotocin was injected. All parameters except body weight, Δw and plasma glucose are given per 100 g of body weight and all values are means ± standard error measured on the 4th day after injection with streptozotocin and before starting treatment with Bauhinia forficata decoction. Serum levels of lactate dehydrogenase activity in normal and streptozotocin-diabetic rats during extended treatment with Bauhinia forficata. Groups: □ normal-control; ■ diabetic-control; △ normal-treated; ▲ diabetic-treated. All values are means ± standard error (n = 10). There was no significant differences in serum bilirubin measurements between diabetic-treated and diabetic-control groups or between these groups and the normal-treated and normal control groups (Figure 2). 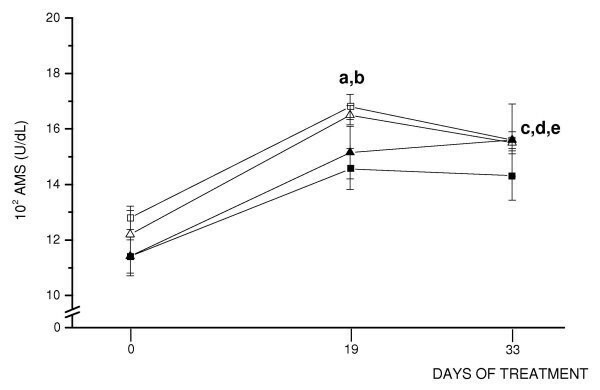 Creatine kinase activity in the four groups was similar at time zero and remained so on the 19th and 33rd day of the experiment, although it tended to rise gradually over the experimental period but within each group the difference between the initial and final activities was not significant (Figure 3). Serum levels of creatine kinase activity in normal and streptozotocin-diabetic rats during extended treatment with Bauhinia forficata. Groups: □ normal-control; ■ diabetic-control; △ normal-treated; ▲ diabetic-treated. All values are means ± standard error (n = 10). Amylase activity was similar in all four groups, although, except for the diabetic-treated group on the day 33, there was a tendency throughout the experiment towards lower values in the two diabetic groups compared with the two normal groups, (Figure 4). There was a significant rise in amylase activity in both the normal groups on the day 19 and in the diabetic-treated and the two normal groups on the day 33 relative to time zero. Serum levels of amylase activity in normal and streptozotocin-diabetic rats during extended treatment with Bauhinia forficata. U = amount of enzyme that completely hydrolyses 10 mg of starch in 30 min at 37°C. □ normal-control; ■ diabetic-control; △ normal-treated; ▲ diabetic-treated. All values are means ± standard error (n = 10). A two-way ANOVA and the Newman-Keuls test was used for comparisons over time within groups (p < 0.05) – different from before start of treatment (day zero) with Bauhinia forficata decoction. Groups: (a) normal-control; (b) normal-treated; (c) normal-control; (d) normal-treated; (e) diabetic-treated. Angiotensin-converting enzyme activity was similar both within and between all four groups and no significant differences was seen between diabetic and normal groups throughout the experiment (Figure 5). Serum levels of angiotensin-converting enzyme (ACE) activity in normal and streptozotocin-diabetic rats during extended treatment with Bauhinia forficata. □ normal-control; ■ diabetic-control; △ normal-treated; ▲ diabetic-treated. All values are means ± standard error (n = 10). Body weight of normal and streptozotocin-diabetic rats during extended treatment with Bauhinia forficata. □ normal-control; ■ diabetic-control; △ normal-treated; ▲ diabetic-treated. All values are means ± standard error (n = 10). A two-way ANOVA and the Newman-Keuls test was used for comparisons over time within groups (p < 0.05): (a) all groups – different from day zero; (b) the normal-control and normal-treated groups different from day 19. The average volume of decoction consumed up to day 33 was 54.8 ± 6.8 ml/24 h.100 g bw by rats in the diabetic-treated group and 15.0 ± 0.5 ml/24 h.100 g bw in the normal-treated group, while average water consumption was 57.0 ± 8.2 ml/24 h.100 g bw in the diabetic-control group and 13.4 ± 0.4 ml/24 h.100 g bw in the normal-control group. The results were similar for the two diabetic and two normal groups although there were statistically significant statistical differences between the diabetic-treated and normal-treated groups and the diabetic-control and normal control groups. The only observable effect being the polydipsia characteristic of diabetes. For the results to be properly evaluated it was essential that the diabetic-treated and diabetic-control groups should show similar alterations in the diabetes-affected parameters prior to treatment with B. forficata decoction, and this is what we in fact found (Table 1). The cytotoxicity of a xenobiotic can be evaluated using the serum activities of marker enzymes. One such enzyme is lactate dehydrogenase, which, though distributed throughout the body, possesses isoenzymes recognised as markers for liver and muscle lesions . It is also well-established that the serum level of bilirubin is raised when the hepatic biliary system is affected . 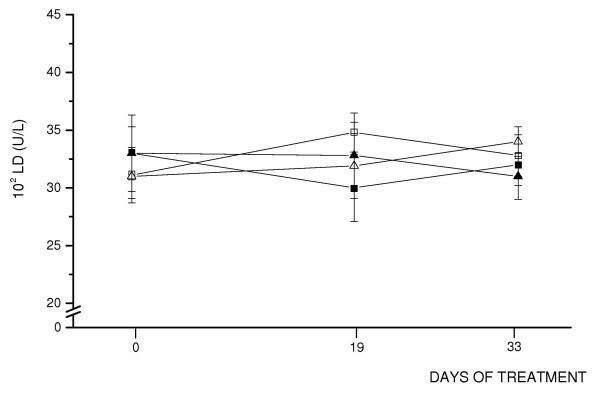 We have previously observed that B. forficata leaf decoction orally administered to diabetic rats leads to an improvement in carbohydrate and protein metabolism  and since our current research shows no change in either lactate dehydrogenase activities or bilirubin levels in either the diabetic-treated or the normal-treated group (Figures 1 and 2) it appears that this improvement occurs without damage to the liver, bile ducts or muscles. It is, however, important to exclude the possibility that the diabetes itself damages these tissues in such a way that serum activities of lactate dehydrogenase and bilirubin are altered  and our finding that the lactate dehydrogenase activity in the diabetic-control group was no higher at the end of the experiment than at time zero indicates that there was no diabetes-induced damage in the liver, bile-ducts or muscles and supports our previous results using the same experimental model over a period of 53 days . There is little published data on serum lactate dehydrogenase activity but experiments in which Tinospora cordifolia root extracts  and certain Egyptian herbs  were administered to alloxan-induced diabetic rats indicate that diabetes leads to raised serum lactate dehydrogenase activity which could be reduced treatment with insulin or plant extracts [20, 21]. Contradictory reports can be found in the literature on the relationship between diabetes and serum creatine kinase activity, which has been variously described as increasing or decreasing in diabetes [22–25]. We have previously shown  that under the same conditions as those employed here the muscle changes resulting from induced diabetes are not reflected in altered serum creatine kinase activity and on this basis it appears that administration of B. forficata decoction does not enhance muscle cytotoxicity. 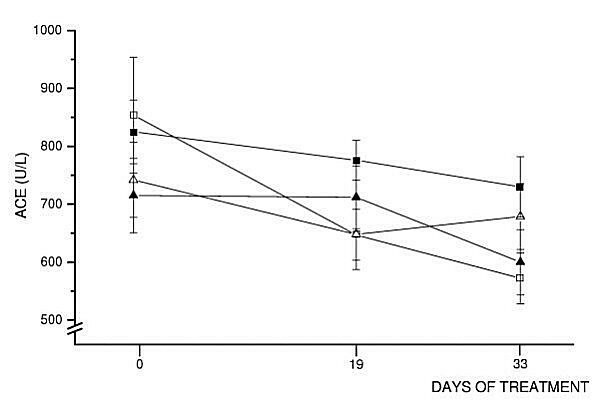 Our current results for creatine kinase activity against time for the diabetic-untreated group (Figure 3) supports our previous results  and the lack of any effect of the decoction on creatine kinase activity in normal rats confirms the lack of cytotoxicity in the diabetic groups. Serum amylase activities in the diabetic groups (Figure 4) supports our previous data in respect to time after streptozotocin injection  and it appears that 33 days of treatment with B. forficata decoction did not alter amylase production in the pancreas or the saliva because serum amylase activities in both diabetic groups were similar both in the middle and at the end of the experiment. In the present study we detected only a tendency for serum amylase activities to be lower in diabetic than normal rats throughout the experiment, such changes possibly being due to endocrine, exocrine and paracrine changes in the parenchyma of the pancreas [19, 26, 27]. In both normal groups the increased amylase activity observed during the experiment may have been related to fluctuations in the rates of amylase synthesis and its secretion by secretory glands, such fluctuations having been attributed to ageing of the animals [28–31]. The significant increase in amylase activity in the diabetic-treated group on day 33 relative to time zero does not necessarily indicate toxicity because there was no significant difference between the amylase activities of the diabetic-treated and diabetic-control groups on day 33, and it appears that the rise in amylase level in the diabetic-treated group on day 33 is probably due to a random effect. The similarity in amylase activity between the two normal groups throughout the experiment supports our other findings which suggest that treatment with B. forficata decoction is not toxic. Angiotensin-converting enzyme catalyses the conversion of angiotensin I to the vasopressor angiotensin II in lung, renal and mesenteric vascular tissue [32, 33]. Published data have demonstrated that serum and tissue Angiotensin-converting enzyme activities can rise, fall or remain the same as a result of diabetes [26, 34–37]. As reported in this paper, previous results obtained in our laboratory showed no change in Angiotensin-converting enzyme activity in the diabetic groups relative to the normal groups . Serum angiotensin-converting enzyme activities have been suggested as an indicator of microangiopathy in diabetics [38, 39] and our finding that angiotensin-converting enzyme activities were unchanged in the diabetic-treated group implies that treatment with B. forficata decoction did not give rise to any increase in the microangiopathy that may have been present in the rats (Figure 5). The body weight of the rats was not altered by the plant decoction in either diabetic or normal rats relative to their respective controls (Figure 6). These results agree with those for the enzymatic markers and also suggest that B. forficata decoction is not toxic. The reduced growth rate seen in the two diabetic groups between day 19 and 33 was probably due to insulin depletion provoking loss of adipose tissue . Garg et al  observed that cattle fed on immature Quercus incana (tender oak) leaves suffered 70% mortality and there was extensive nephro- and hepatotoxicity due to hydrolysable tannins and simple phenols in the leaves but despite the presence of tannins in B. forficata [2, 3] there appeared to be no renal or hepato-biliary toxicity in the rats because we found no change in lactate dehydrogenase or angiotensin-converting enzyme activities or in bilirubin levels. The concentration of tannins and other components of B. forficata leaf decoction is still unknown and this prevents a comparative evaluation of this extract with other tannin containing extracts. The serum marker assays indicate that although the B. forficata decoction did not provoke any worsening of diabetes-induced tissue-changes it also did not bring about any improvement. Such findings should be quite reliable, since they were obtained with markers (lactate dehydrogenase, creatine kinase and angiotensin-converting enzyme activities and bilirubin levels) that are not influenced by diabetes per se, although the data on serum angiotensin-converting enzyme activity should be interpreted in the light of its inherently altered level in diabetic animals. On the basis of these results we conclude that Bauhinia forficata leaf decoction could be of use in the treatment of diabetes because it improves the diabetic condition without causing tissue toxicity detectable by biomarkers appropriate for this experimental model. We thank FAPESP, FUNDUNESP and PADC-FCF (UNESP, Araraquara) for financial support. We are also grateful to the technicians TN Nunes and FA Iagame for their help and to Dr. GD Zanetti, Industrial Pharmacy Department Herbarium, Federal University of Santa Maria, Rio Grande do Sul, Brazil, for identification and authentication of Bauhinia forficata. MTP: participated in the elaboration and execution of the project, determination of the biochemical parameters, discussion of results and elaboration of the manuscript. AMB: assistance with animal-handling and in the determination of the biochemical parameters (student fellowship from Fapesp and PIBIC).